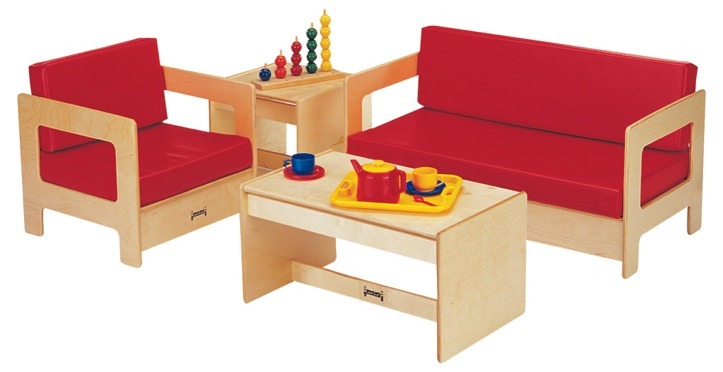 Ideal for reception area seating or an imaginative play living room. Handsome pieces are crafted from Baltic Birch, the strongest plywood in the world. Safety features include rounded edges and corners and sturdy kickplates. Extra durable, non-toxic and lead-free KYDZTuff® finish that will not yellow. Foam cushions are covered in 100% virgin vinyl, easy to clean with mild soap and water. Available as 4 piece sets or as individual pieces. Choose from red or blue cushions. Each unit ships fully assembled and includes a lifetime factory warranty. COUCH: 37½" Wide x 20" Deep x 20" High, Shpg. Wt.= 40 lbs. EASY CHAIR: 19½" Wide x 20" Deep x 20" High, Shpg. Wt.= 24 lbs. COFFEE TABLE: 25" Wide x 15½" Deep x 13" High, Shpg. Wt.= 18 lbs. END TABLE: 15" Wide x 15½" Deep x 13" High, Shpg. Wt.= 13 lbs.